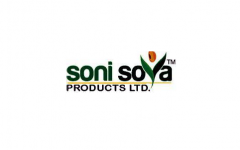 Business description - Soni Soya Products is engaged in the business of processing and trading of organic and Non- genetically modified organisms (non-GMO) agricultural products such as Soya, Maize ( Corn), Wheat, Flax seeds and Mustard, Oil, Rice, Pulses, Herbs, Spices, and other grains. The company is registered with U.S. Food and Drug Administration pursuant to the Federal Food Drug Cosmetic Act, as amended by the Bioterrorism Act of 2002 and the FDA Food Safety Modernization Act. The company is also registered with Agricultural and Processed Food Products Export Development Authority of Government of India (APEDA) to export such scheduled products as per APEDA Act, 1985. The company’s customer base is spread across the globe with presence in countries like Canada, Dubai, South Korea, Sri Lanka, United States of America. Majority of its sales revenues are through direct exports which contributed 97.71%, 82.05% and 67.84% respectively to its total sales revenue for the financial year ended March 31, 2015, 2016, and 2017 respectively. Soni Soya Products IPO allotment status is now available on Bigshare Services' website. Click on this link to get allotment status.